2. Get's really nice AoE Range and Nova effect with Ring of Blades Viridial Jewel and Some Projectile Speed. 4. Gain #% of Physical/Elemental as Chaos is by far the strongest Mod this Leauge, and you can make a good use of that, scaling of a high Base Damage. 5. As this Spell hits, we can make use of some "On Hit" mechanics like as gain life/gain mana. But we have 100% accuracy, because it's a Spell. 6. Does not require much sockets, letting us have a lot of Quality of Life Gem Setup's. Great Defense, Cast Speed and Damage. - Are there other choices? Main Idea of this Build is to stack as much global physical damage and global chaos damage and X% of Physical Damage gained as Chaos Damage to maximize the Damage. Shaper/Guardian without Flasks at 1.1 Mio DPS, Vaal RF, Power Charges. With Them over 2 Million. Ah and your Totems do 600k DPS just by themself. Can't run Elemental Reflect if you have Elemental Damage mod's on the Gear or Herald of Ash active. Switch from Swiftkiller to Harness the Void, as you feel that maps are no longer an Issue for you. Why Harness the Void and not Swiftkiller? - Swiftkiller is greater for Mapping as it is easy to have all your charges up all the time. Different in Boss fights, where you don't always have Monster's to kill. Swiftkiller is an overall damage loss with a potential higher Spike, maintaining full charges while you fight tough encounter is nearly impossible, and should not be a priority for you during this fight. You can gain Charges on other way's - Assassin's Mark Blasphemy will give you Charges, also some new Synthesis implicits or Elder Mod on Gloves, can provide you Charges, making Swiftkiller a bad choise. What about CI? - you can take CI with Ghost Reaver, just drop some Shield Spell Damage nodes. But, as you already have over +100 Chaos Resistance with Ming's Heart i don't feel like it is necessary to loose 2k EHP dropping you from 10k EHP to 8k EHP. If you go CI, then consider going for Mark of the Shaper + Elder Ring instead of Ming's. Why Discipline with Bloodmagic? - You can make some use of Lowlife, but you actually never use it besides Boss fight's. In most of the Bossfights is ABSOLUTE 0 Chaos Damage, such as Shaper, Elder, Uber Elder, Nexus and Cortex Bosses, Delve Bosses, Bestiary Bosses, Shaper Guardians, and Elder Guardians. Only Chauyla, Chimera and The Constrictor and Fenumus, First of the Night do some Chaos Damage. So you fight them without Discipline. For all other Bosses Low Life is 25% free more Damage and 1000 free Energy Shield. For General Mapping this Damage and extra Energy Shield is not needed at all. So just run with deactivated Discipline. or some Rare with Energy Shield, Resist, Strength. there are no other good options. You can use a Dream Fragments Ring, if you feel annoyed by Chill/Freeze. Absoulte must for "You can apply an additional curse" corruption to use both Projectile Weakness and Assassin's Mark. Or Some Rare with Spell Damage, Cast Speed, Crit Multiplier, and "You can apply and additional curse"
or some Rare Multimod Boots with Cannnot be Frozen, 20% Movement Speed Cannot be Chilled (Those Probably will cost over 5ex) and Brinerot is a Great choise for 5-20c. 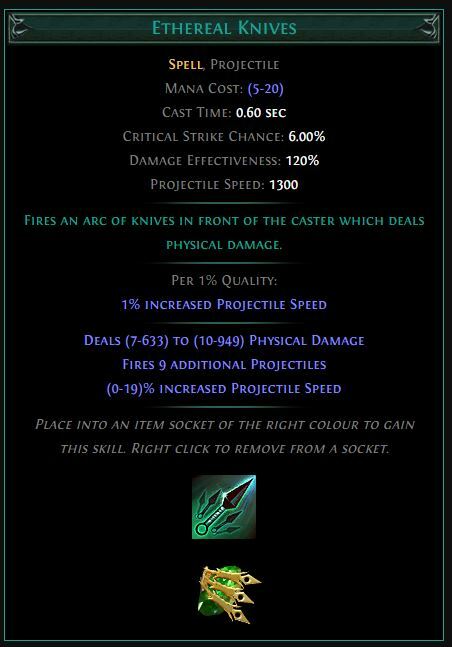 Elder Based Sorcerer Gloves with Socketed Gems are supported by Level 20 Faster Projectiles and Attack and Cast Speed, some Resist, Energy Shield. Those are pretty cheap, and can be greatly crafted with Shuddering + Aetheric Fossil. Helmet: Any Hubris Circlet With Ethereal Knives 40% increased Damage enchant. Cost about 20c. Chaos or Fossil craft for Some ES/Resist. Shield: Any ES Based Shield with ES/Resistance/Spell Damage. Body Armor: Any Hybrid Armor with as much Evasion/ES as you can get. Weapon: Any Weapon with a lot of Spell Damage, Crit Multiplier, Crit chance for Spells, Gain #% of Physical as Extra Chaos Damage or Extra Elemental Damage of Fire/Lightning/Cold and Projectile Speed. Jewels: ES, Crit Multi, Add Physical Damage to Spells, Add Physical Damage to Spells while holding a Shield. As you see there are some Elemental Damage sources, as well as Herald of Ash making me unable to run elemental reflect maps but giving me more overall damage. This item has a great synergy with Ethereal Knives + Chain Support, as you get 3 Chains and a Whooping Gain 60% of Physical Damage as Extra Damage to that hit. It feels great on Maps, however this nasty Loose 10-15 Life for each enemy Hit by your Spells can drop your Life down quicker then your Leech from Gloomfang can work now, as it is capped by 20% of your Life per second. Gloomfang has 0.5% Chaos Damage Leeched as Life, that is more then enough to cap your Lifeleech at 20% - 400 Life per second. If you hit 20 Monsters with 6 Hits a second it equals to 60 hits that degen you 1200 to 1800 Life depending on your Gloomfang roll, while you only sustain 400 Life in the Same second. And additional Chaos Damage from Somewhere, and you are Dead. there is a "Workaround" for it provided by a nice Community guy making it even possible for CI and Lowlife to use Gloomfang, but as it does not provide any damage in Boss fights, i did opt out of Gloomfang in the late Stage of this build as my Damage on Maps is Insane Anyway. Care more about Boss Damage now. However it is a great item, and makes a lot of fun to play. You have to get rid of Mana Leech Support for Chain Support to do that, and for this you will need Boots with 0.5% of Damage Leeched as Life and Mana when you Killed Recently enchant. I still use Gloomfang + Chain now and then when i go for really fast mapping in a bulk, but got to lazy to switch for Mana Leech Support before Bossfights, makes me run Mana Leech Full Time. All this will not work on Bosses, letting you with no Mana, and no extra Damage. Hey, just trying out this build, so far leveling has been a breeze - just wondering why you take Pain Attunement? I don't see how you're getting to Low-Life, unless you're putting yourself there with blood magic somewhere? I believe that's from his Blood Magic + Discipline. I missed that, so with that, I guess you could also throw on either the Banner or Herald of Ash to proc pain attunement. I'll experiment with that. Discipline with Level 20 Bloodmagic leaves you with 32% unreserved life. if you manage somehow to get Bloodmagic to 23, it will leave you with 35% Life. it defently can clear maps and synthethis, with ease and insane speed. not as good for bosses, because EK is not a single Target spell. Why don't you use energy leech support with EK? Also, you can level up your increased duration linked with CWDT. The level of support gems doesn't matter with CWDT's level restriction. you have Soul Thief for Leech, ES Leech is caped by maximum Life recovery, Energy Leech support does not give any, so not needed at all. even with 0.5% from Soulthief you will be at max 10% es Leech on hit rate due to huge damage. thx for tip for Inc Dur. Right now im playing with CWDT + Chaos Golem + Tempest shield + Immortal Call.